COCHRAN, GA – P.L. Williams of Dublin, GA came back from a lap 30 spin to win the NeSmith Chevrolet Dirt Late Models Series RockAuto.com Winter Shootout Round 7 40-lap race on Saturday night at Cochran Motor Speedway driving the Dublin Tire TNT. Williams spun in turn one on lap 30 while battling for the lead with Jeremy Faircloth of Swainsboro, GA.
NeSmith Chevrolet Dirt Late Model Series officials ticketed Faircloth with the caution flag, and put Williams back on the point for the restart. During the caution period, Williams had to dodge another bullet when Faircloth drove in front of Williams on the front straightaway and “brake-checked” the leader. Williams’s car went under Faircloth’s car. Also collected was Montana Dudley of Phenix City, AL, who ended up colliding into the back of Williams’s car. Williams was able to continue for the restart, followed by RockAuto.com Winter Shootout point leader Chase Edge of LaFayette, AL, Dudley and Riley Hickman of Cleveland, TN. Edge was trying to clinch the RockAuto.com Winter Shootout Championship with a top five finish. Edge was also trying to get around Williams in the last 11 laps of the race, but none of that came about. After taking the white flag, Edge went for broke on the last lap, but his car spun in turn two and hit the inside wall. Edge failed to finish and failed to clinch the championship. For the title clincher, Edge will have to return to Cochran Motor Speedway for tomorrow’s 50-lap $2,500-to-win show. To clinch the 2016 RockAuto.com Winter Shootout Championship, Edge will need to complete at least one qualifying lap in the Edge’s Gas Company Special to secure a minimum of 30 points. Dudley in the Zaxby’s Rocket and Hickman in the Hickman Manufacturing CVR took advantage of Edge’s misfortune to finish second and third respectively. Chesley Dixon of Swainsboro, GA started 20th and finished fourth in the Central Fence Company Special to earn the Beyea Headers Hard Charger of the Race Award. Ben Faircloth of Swainsboro, GA finished fifth in the Hall Longhorn Farms GRT, and Jordy Nipper of Gray, GA took the sixth spot in the Scotty’s Muffler Special. Jimmy Thomas of Phenix City, AL was seventh in the Five Star Hyundai Special. Joshua Bishop of Statesboro, GA drove the Augusta Industrial Services Special to an eighth-place finish, while Larry Harrod of Plains, GA finished ninth in the Harrod Logging Special, and Jody Knowles of Tyrone, GA rounded out the top ten in the Clayton Signs Special. In three starts with the NeSmith Chevrolet Dirt Late Model Series RockAuto.com Winter Shootout, Williams has two third-place finishes and a win. That kind of a finishing record now has the youngster and his family thinking about the future with the start of the 2016 NeSmith Chevrolet Dirt Late Model Series National Tour on April 8-9 at I-75 Raceway in Sweetwater, TN. In preliminary action, Jeremy Faircloth was the Fast Qualifier among the 31 entrants with a lap around the 3/8-mile clay oval in 15.587 seconds in the LJR Forestry Warrior. The two ten-lap B-Main races were won by Knowles and Nipper. Jeremy Faircloth took the lead at the start of the race followed by Williams, Edge, Thomas, and Terrance Nowell of Phenix City, AL in the Harrod Logging Special. A multi-car tangle in turn two on lap two took out Marcus Minga of Shannon, MS in the B&M Salvage Rocket, along with Smith Station, AL drivers Rodgerick Dykes in the Braswell Bodies Chevrolet and Richie Stephens in the K&J Trucking Special. The wreck also damaged the BMC Motorsports Special of Cale Conley of Vienna, WV, but he was able to continue. This was important in the RockAuto.com Winter Shootout point battle, as Conley was the only driver with chance to beat Edge for the series’ championship. Thomas got by Edge for third on the restart. Edge and Nowell tangled in turn two on lap three, but the race remained green. 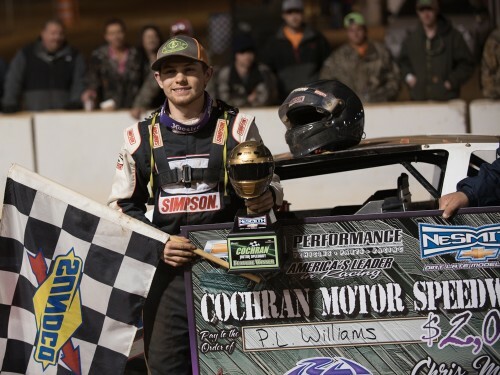 Will Herrington of Cochran, GA drove his Herrington Auto Warrior up to the fourth spot. Edge was able to come back and reclaim the fourth spot from Herrington on lap five. By lap nine, race leader Faircloth was in lapped traffic. The second caution flag of the race came out on lap ten with Robbie Metts of Albany, GA spun the J&H Transmission Special in turn one. Jeremy Faircloth had Williams, Thomas, Edge, Herrington, Nowell, Hickman, Knowles, and Nipper doubled up behind him in second through tenth respectively for the Dixie-Style Double-File Restart. Herrington spun on the restart, and Nowell was ticketed with the caution flag, and had to go to the tail of the lead lap cars for the next restart. When the green flag came back out, Edge got by Thomas to take over the third spot, and Knowles came from ninth up to sixth. Metts brought out the caution flag for a second time on lap 15 with a spin in turn two. The top ten respectively for the restart were Jeremy Faircloth, Williams, Edge, Dudley, Thomas, Hickman, Knowles, Ben Faircloth, Nipper, and Dixon. Ben Faircloth came from eighth to sixth and Dixon came from tenth to eighth on the restart. By lap 23, Jeremy Faircloth took a half straightaway lead into lapped traffic. Williams closed in on the back bumper of Jeremy Faircloth by lap 25. On lap 28, Faircloth slid up the banking in turn two, and Williams dove underneath to take the lead. That led the lead duo into turn one on lap 29 for their confrontation. 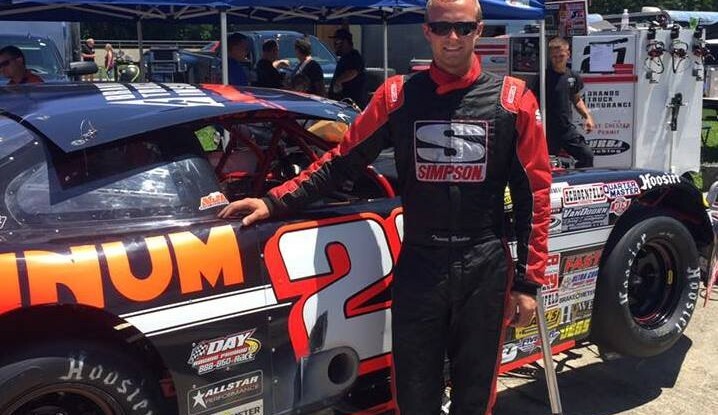 With Jeremy Faircloth’s actions on and off the track, he was disqualified from the event by NeSmith Racing officials. Williams led a single-file restart down to the green flag, and at first held a comfortable lead over Edge. By lap 35, Edge began to close on the leader, but couldn’t get a fender inside Williams. After the lead duo took the while flag signaling one lap to go, Edge went for broke in turn two, spun and hit the inside wall. Williams went on to post the $2,000 victory. The NeSmith Chevrolet Dirt Late Model Series returns to Cochran Motor Speedway on Sunday for the RockAuto.com Winter Shootout finale with a 50-lap $2,500-to-win main event. Gates open at 12 Noon with a Church Service. NeSmith Chevrolet Dirt Late Model Series Pre-Race Registration will be from 12:30 to 2 p.m. The Drivers Meeting will be at 2 p.m. with Hot Laps scheduled for 2:30 p.m.
For more information and rules about the NeSmith Chevrolet Dirt Late Model Series, visit the series web site at www.nesmithracing.com, or visit the series on Facebook at NeSmith Racing. Becoming a fan of the NeSmith Racing Facebook page will make you eligible for special prizes that will be given away each month. You can follow us on Twitter @NeSmithRacing. 1ST B-MAIN: 1. Knowles; 2. Bloodworth; 3. Dykes; 4. Conley; 5. Minga; 6. Harrod; 7. Parkhurst (Y); 8. Mike; 9. Wood (Y); 10. Boyett; 11. Pennington. 2ND B-MAIN: 1. Nipper; 2. Stephens; 3. Carter (Y); 4. Arthur; 5. Dixon; 6. Bishop; 7. Bidwell; 8. Diekemper; 9. Register; 10. Britton. 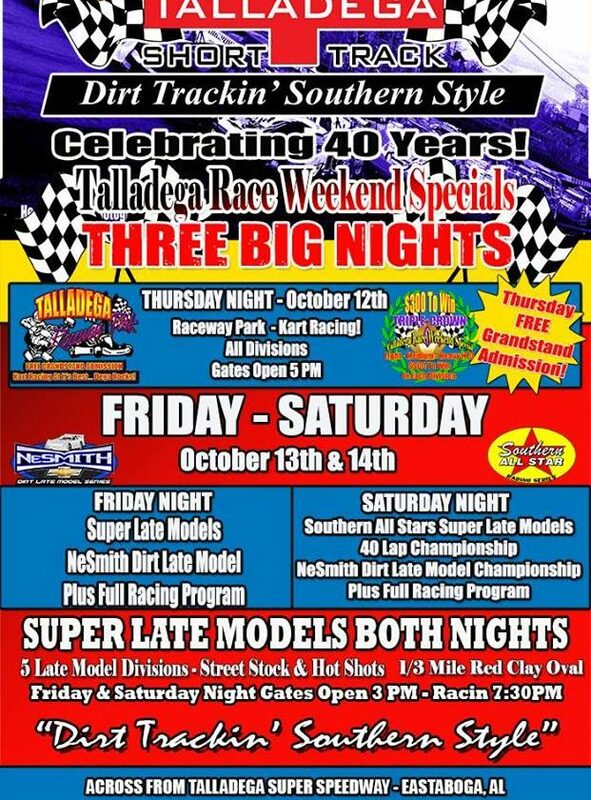 NeSmith Chevrolet, Buick, GMC of Claxton, GA is the Title Sponsor of the NeSmith Late Models. NeSmith Chevrolet, Buick, GMC is the nation’s number one GM Powertrain and Performance Dealer six years running, with free delivery anywhere in the Southeast. Chevrolet Performance Parts is an Official Sponsor of the NeSmith Late Models. Hoosier Racing Tire is the Official Tire Sponsor of the NeSmith Late Models. RockAuto.com is an Official Sponsor of the NeSmith Late Models. 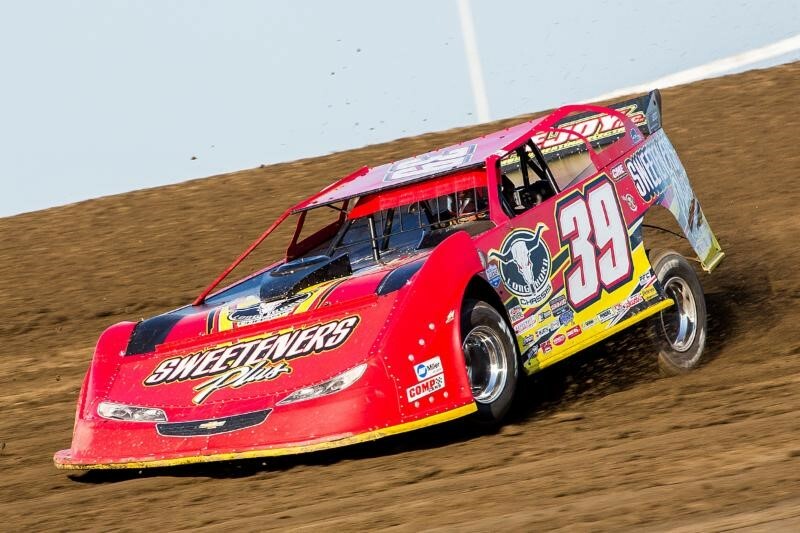 Beyea Headers is the NeSmith Late Model Hard Charger Sponsor. Sunoco Race Fuels is the Official Race Fuel of the NeSmith Late Models. Panama City Cycles is the Official ATV Provider of the NeSmith Late Models. AR Bodies is an Associate Sponsor of the NeSmith Late Models. NeSmith Late Model Contingency Sponsors for 2015 are CrateInsider.Com, Integra Racing Shocks, Image Screen Printing, and Gresham Race Parts. 2015 Chassis Sponsors are Trak-Star Race Cars, Warrior Race Cars, Rocket Chassis, GRT Race Cars, and CVR Race Cars.